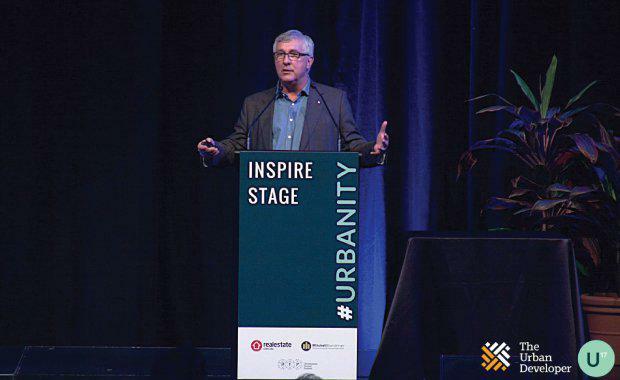 In this session from Urbanity '17, Queensland Government Architect Malcolm Middleton offers an honest recount on how he’d re-imagine Brisbane City if it were to better capitalise on the immense opportunities around its river network. improved economic outlook which promises to create increasing employment, tourism and commercial opportunities. Middleton says that great cities share many common attributes -- they have great locations, great natural assets and great urban interventions. Infrastructure must be proactive, cities must be able to actively measure current conditions to plan for the future -- and in the era of technology and "smart cities", we need to anticipate how our citizens will use cities sustainably and efficiently. Middleton reckons there is a fundamental flaw in how Brisbane addresses the opportunities around its river network, and as we enter an era of technological disruption, he feels the key to embedding much longer term amenity and connectivity into Brisbane lies in addressing the city's relationship with the river. Of the world’s major river cities, Brisbane has the least bridges despite having the particularly "developable" river-frontage. Within the 5km radius around Brisbane, there are currently 0.3 bridges per kilometre of river -- as a comparison, Chicago has 2.6 bridges per kilometre. Middleton proposes that in the next two years Brisbane builds ten bridges, which he anticipates will cost the city $1 billion, but will have a profound effect on creating a more active, less congested and healthier city. If you're inspired by this session and would like to keep informed about Urbanity 2018, please register here.